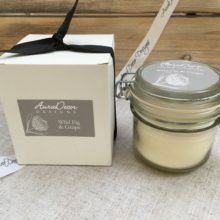 Our British made room fragrance range of natural soy wax candles, soy melts and reed diffusers combine the best quality essential oils, dried flowers, berries and indigenous herbs to safely fragrance the living areas of your home. 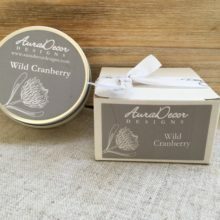 Our branded range is poured for AuraDecor Designs using only natural ingredients, carefully blended to produce a delicate room scent best suited for the home. The relaxing powers of the essential oils are good for your health and wellbeing making them ideal gifts too. Hint – When burning your candle for the first time, allow the wax to form a liquid pool which reaches the edge of the container. 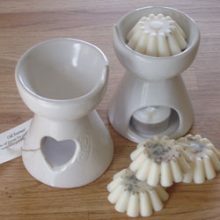 This prevents a ‘crater’ from developing in the middle of the candle, and will maximise the burn time of your natural wax and essential oil candle. Reed Diffuser Candle Gift set – An elegantly presented combination gift set ideal for the discerning home maker. 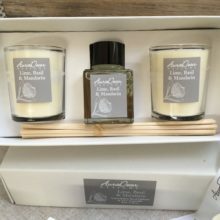 The Gift set comprises of 2 natural plant wax candles in glass votives, and a natural essential oil glass reed diffuser with reeds. Our range of soy wax candle melts with essential oils and herbs are handmade in Britain. Drop your melt in the bowl of the Oil burner, place your tea-light in the base and light. As the candle is warmed it releases the powerful aroma of the essential oils. Oil Burner available to purchase seperately. Akasha – Symbolising the fifth element with essential oils of Vetiver, Grapefruit, Lemongrass and Rosemary. Health Melt – A combination of dried St John’s Wort and essential oils of Rosemary, Marjoram and Lavender (associated with good health, well being, healing and calm) and a hint of Clary Sage to help fight depression. Kitchen Witch – Banish unwanted cooking and kitchen smells. Contains essential oils of Lemongrass, Thyme, and Rosemary associated with purification and uplifting. Love Melt – Love thyself with the relaxing aromas of the essential oils of Rose, Palmarose and Orange. (melts with dried rose petals). Midsummer Melt – Chamomile, Lavender, Lemon Verbena , Basil (melts with dried chamomile flowers). 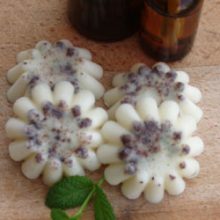 Moon Melt – Lemon, Camphor clary sage and a hint of sandalwood (melts with dried seaweed). Persephone’s Dawn – A fresh green aroma with essential oils of Lavender, Jasmine, Lemon, Clary Sage (with dried lavender). Sun Melt – Marigold, Orange and Rosemary essential oils (melts with dried Marigold petals) to lift your mood.